This time we will be reading in Hughes & Hughes in the St. Stephen’s Green Shopping Centre, next Thursday 21st June at 7pm. The book will be on sale and wine will be provided, anyone is welcome to drop in an hear us read our stories and poems. If you just can’t wait till then A Thoroughly Good Blue is already on sale in Hughes & Hughes, right at the front door, you can’t miss it! So far Zach Hively, reading ‘In the Haus of Broken Toys‘, Katie McDermott, reading ‘Mrs Culann’s Dog‘, Vanessa Baker reading ‘With the Band‘, and Alice Youell reading ‘The Waiting Room‘, Liz McManus reading ‘The Disappeared‘ and Brent Dougherty Mueller reading ‘Children of the End‘ have been uploaded. More will be added over the coming days. It’s always great to see writers at the start of their journey, though there are some in this anthology who appear to be well on their way. A Thoroughly Good Blue is an exuberant and diverse collection of fiction and poetry from the students on the M. Phil. in Creative Writing at Trinity’s Oscar Wilde Centre. It is a multicultural collection, which adds to its rich tone; here are writers who are from, or who have lived in, Ontario, Hong Kong, Missouri, Mayo, The Netherlands, Meath, Colorado and New Mexico. They bring with them to their work all of the exotic words and occurrences of these places. From the spareness of Melony Bethala’s ‘Boat Ride on Lake Pontchartrain’, to the rich prose and slowly delivered beauties of Sara Mullen’s ‘On the Hill of Speculation’, A Thoroughly Good Blue is an impressive gathering of finger-on-the-pulse work. Humour is provided by John Dodge in ‘Mile High Circus’ with Pickles the clown and a crazy but ultimately kind Mayor. Yaseena McKendry does mystery well in the opening to the novel ‘Winter Trees’; there is a menacing, melancholic atmosphere in this piece – we are at a funeral in chapter one. Liz McManus’s masterful novel extract ‘The Disappeared’ is marked out by assured writing, delight in the natural world, great dialogue, and a beautifully described swan. A story of a life squandered, by Vanessa Baker ,sees a 12 year old girl brought to her first gig by her brother; this sets the girl up for life as a groupie and, ultimately, regret. Zach Hively dazzles the reader with a menacing story set in Germany. A little boy falls in love with a woman and wants to rescue her, whether she needs rescuing or not. His mission brings him into a dark, dusty and creepy hostel that is peopled with mutant toys. The language is exuberant – there are lots of lively images such as the clubfooted pigeon whose foot looks like melted plastic, and an old man with ‘wet tissue paper hair’. I’m a writer who delights in language, I love a good stylist, and I found plenty of that in this book. In Hsiang-En’s poem ‘Monday Morning Tram’ we find ‘like sculpture in an art exhibition, the passengers all look the same’, and in the poem ‘Tsingtao Brothers’, beer ‘softly sputters to kiss the nose / When held close to parched lips.’ Here is a poet who revels in delicate language and apt visuals. Much like fiction writer Malu Bremer in ‘After the Tone’, where a mother loses her unborn baby while saving her daughter from drowning in an ice-hole. The mother goes slowly mad, which makes the daughter leave. The language is stunning in this piece. We have ‘a smile thin as a paper cut’; ‘a necktie the colour of old sweat’; and ‘marzipan light’ that ‘hangs low over the town’ where icicles ‘weep themselves smaller’. In this anthology there are talking wolves, corruption in a third world country, unreliable narrators who want to be ill, and young girls facing their mortality. We have mythology in the form of a modern day Cú Chulainn in ‘Mrs Culann’s Dog’. As well as in ‘Lament’ by Eimear Ryan, where a group of teenagers entertain themselves by pretending to be banshees by night, keening outside people’s homes. Eerily, the victims often soon die. The narrator lives with her feisty but ailing granny. Granny likes to tell it like it is: ‘Put [the egg] in water,’ she says. ‘If it floats, it’s fucked. Like a goldfish.’ This story is interwoven with the legend of Diarmuid and Gráinne – Gráinne was doomed to roam as a shapeshifter, keening her lost love. The banshee game turns sour, however, when the ringleader decides the narrator’s granny is next on the list. Poet Eamonn Lynskey looks at life’s big questions: religion and how the earth was made. His poem ‘Early Christian Chronicle’ is a list poem of prayers, Popes and presences. As a teenager the narrator ‘felt the axe descend / and split in two the breastplate of my faith’. All I can give you is a flavour of what is in this anthology. What you really need to do is buy it, as an e-book or in hard copy, and enjoy it for yourself. I wish all the writers within the pages of A Thoroughly Good Blue the very best of luck with completing the M. Phil. in Creative Writing at Trinity and with their writing careers. May your ink always flow. This post is by Liz McManus, Excerpts from her novel The Disappeared appear in our anthology. In 1989 I won the Short Story Award at Listowel Writers’ Week. A proud moment but, to my lasting regret, I couldn’t travel down to Kerry for the award ceremony because a General Election had been called. A friend received the award on my behalf and trundled back to Bray with an inscribed cut-glass decanter with my name on it. I put it on the mantelpiece but it wasn’t the same. I knew I’d missed something special. Life as a politician demands total commitment The writer and political activist, Grace Paley once said, when she was asked why she never wrote a novel “ Because life is the short and art is too long.” That rang a bell with me. But second chances do come along. 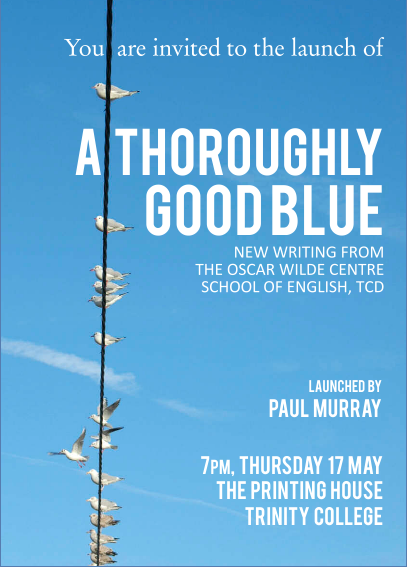 This June, other writers and I will be travelling to Listowel, not to receive awards, but to give readings from A Thoroughly Good Blue. 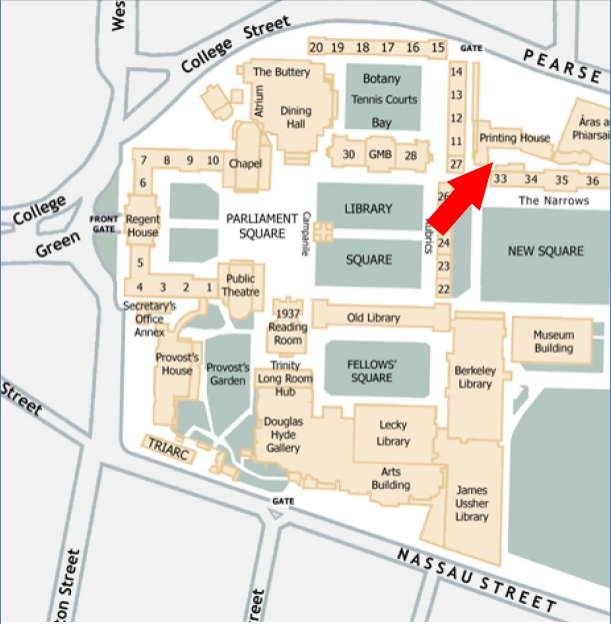 We will be a representative group from the Master’s in Creative Writing Class of 2012 in TCD. We come from the United States, China, Belgium and Bray. We are poets and fiction writers; young writers and not so young. We will be going to a unique place of literature in Ireland, since Listowel has been the birthplace of an extraordinary number of writers. For me, it will be a special journey. In my mind I’ll be going to pick up that award and I’ll only be twenty-three years late.